This version of Positivism, also British, focuses on defining EVOLUTION as a fundament. It is more-or-less placed parallel with Darwin's EVOLUTION. Actually, it can be considered as its theoretical base. 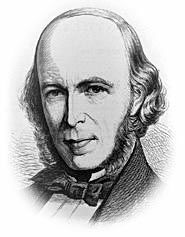 Its main supporters are William Hamilton (1788-1856), Henry Longeville Mansel (1820-1871) and, most of all, Herbert Spencer. Spencer intended to justify 'progress' as a universal and cosmic fact. In this parameter, this thinker sees the possibility of a match and conciliation between religion and science. For Spencer, both disciplines are based in 'mystery': THE UNKNOWN. Both try to explain the unexplained in their own way. For Spencer, PHILOSOPHY consists in knowledge in its highest level of generalization. From these 3 constants (‘fundamental laws of physics', since Galileo, Descartes, etc. ), Spencer deducts the LAW OF EVOLUTION, which states the following: Matter goes from a diffuse state to a state of integration (or concentration). Meanwhile, the power used to make this happen dissipates. This ‘evolution law’, whose remote origin can be traced back even to the times of Heraclitus or Empedocles ("birth and death as union and separation"), signifies the transition from a less coherent shape to another more coherent one (going from homogeneous to heterogeneous). According to Spencer, this can be applied to any field in knowledge: PSYCHOLOGY = the study of manifestations in our consciousness. ETHICS = the study of the progressive adaptation of man to his life conditions. In ‘Evolutionist Positivism’, in its final stages (second half of XIX), we can quote Thomas Huxley (1825-1895), William Clifford (1845-1879), among others.